Originally posted at TexasRiverBum.com on 15 August 2011. 0315 – This is going to be rough. I hate mornings because I am such a slow starter. But my brain slowly goes to recovery mode and recalls the plan to meet my new found friend Dave at his house by o’dark-thirty, (that’s Army translation for anything before sun-up) and in this case is 4:30 in the a.m.
What was I thinking when I signed up for this? Oh yeah, he is going to teach me fly fishing and apparently fishing universally means the early the better. Well, anything worth doing usually comes at a cost like this so I’ve eagerly agreed to the price of admission. Dave for some reason has taken up teaching this infantry grunt out of some unknown and unearned kindness. For this I am grateful. I jotted down the mental note of the angler I want to be and assume the debt of “pay it forward”, by the example set before me. There is more than fish in this river today. We’re heading to the Colorado River to a spot Dave did a recon on the week before. It’s above Lake Travis where the recent dry spell – going on for some time now, has areas of the man-made lake back to its river roots. The water level is nearing 30′ lower than average so our trip has a rediscovery allure to it. We rig up in the dark. The morning air is already humid and I cannot wait to be waist deep in the cool water. Before I step off the bank I’ve already been taught a new knot and handed newly minted flies. They’re like gold nuggets in my hand, their mettle soon to be tested in battle. My first fish is a drum. He’s a little guy and after a quick photo he’s set free. Either he didn’t learn his lesson, likes me a whole heck of a lot, or has a twin – but my second fish to hand bears a striking resemblance to the first. I’m slowly becoming addicted and am dying to catch a bass. Too many images of the fishing channel trophy bass on cable television flicker in my head. Here fishy, fishy, fishy. Here fishy, fishy, fishy. I’m suddenly 7 years old again and nothing is cooler on earth. Dave has caught a few small bass and lost a large one before he catches the bass of the day. He does this effortlessly. Literally – he didn’t even try. 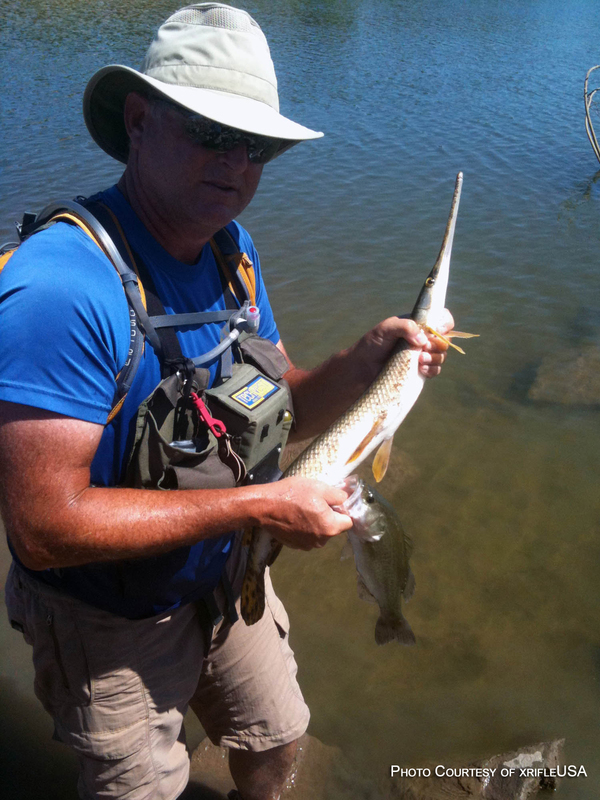 Frustrated about losing the big bass, he targets gar and eventually lands one on his ultralight outfit after a good fight. I didn’t know gar could dance or that their leaps could span the water’s surface by 20′. Dave coins the term ‘Rocket Fish’ and for me, thus shall gar ever be G.A.R. – Guided Aquatic Rockets. As he wrangles the 30″ FUGLY-flopping fish into his 24″ net, he patiently wades and closer to the bank so I can close in for the picture-op. He’s removed the hook and flung it to the side. Well, at some point a nosey Largemouth Bass has inquired on the ruckus and found a quick meal; Dave’s hook. 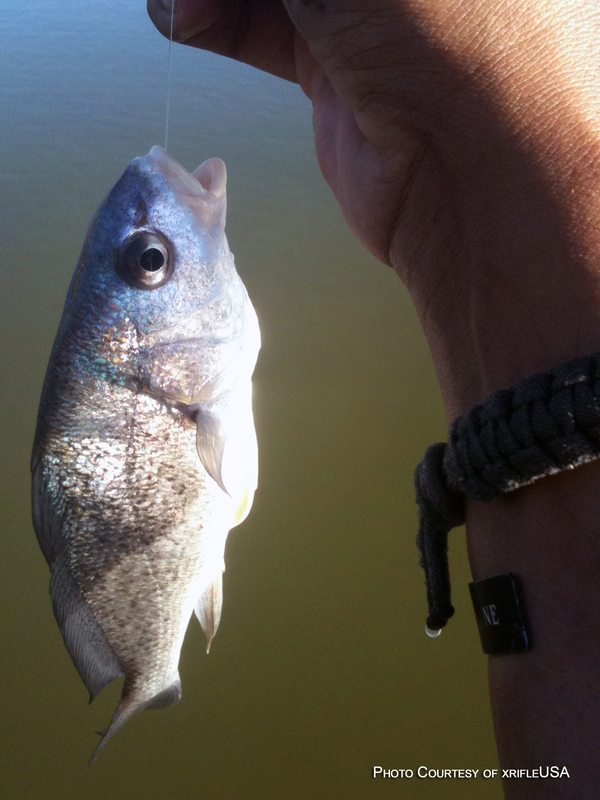 I’m false casting my arm to the point of falling off and still bass-less and with a flick of the fly he finds one. Lesson learned: Murphy’s Law of Texas Fly Casting number 9, don’t care, don’t target- just fish. So, gar fish half in hand – half in net, Dave uses the “3 Stooges” technique to pull in fishy number two of a one cast series. Mid-day and we are out of time, the demands of the real world beckon us, so with me still bass-less we have to retreat from these waters. Today was but a small skirmish, to prepare me for the more serious fly fishing engagements I’ll soon face. For me though, I’ve caught more than fish to hand. I’ve caught a fever; hot air, cool water, and I’ve become consumed with casting flies on the water. Remember your first fish when you caught the fever? Now days later, every nearby stream beckons me. The current calls to me in the ripples of every brook. The craving for the simple serenity of fly casting soothes my soul when in the water – ironically, the hook is set. More than fish has come to hand.